FRIDAY DAY TICKETS – The Peach Music Festival comes for another incredible instalment this summer season! With it's ever growing fan base, this annual event gives music lovers a place to enjoy it to the full, with an out of this world line-up for sheer talent, the 2019 festival is quickly becoming the one on everyones must-go list! Get down to catch the best talent in music and all of the festival feels that you would expect to experience! Here's your chance to book a day pass for Friday as it to Pavilion at Montage Mountain on 26th July 2019! 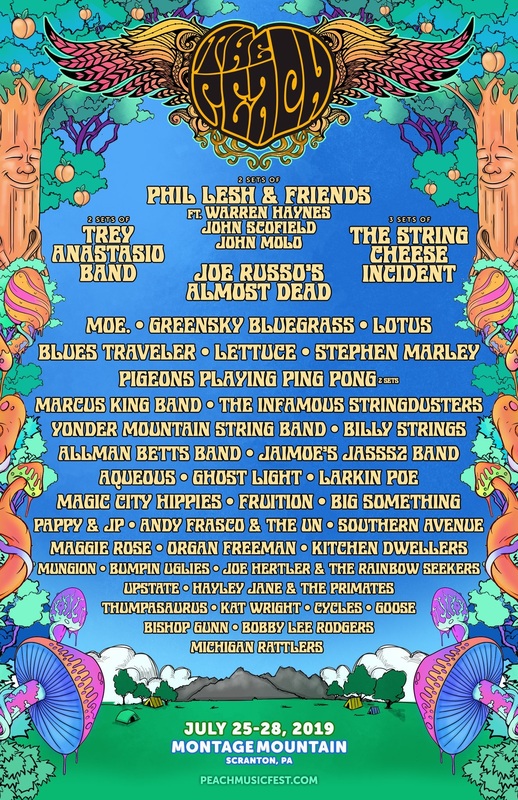 Performing at this years Peach Music Festival is; Phil Lesh & Friends featuring Warren Haynes, The String Cheese Incident, Joe Russo’s Almost Dead, moe., Greensky Bluegrass, Lettuce, Blues Traveler, Lotus, Stephen Marley, Pigeons Playing Ping Pong, John Scofield, Marcus King Band… Some of the artists on the bill will play not once but twice around the festival weekend which gives their lucky fans another chance to catch them live at Peach Music. These names include the likes of John Molo and Trey Anastasio Band! This incredible weekend brings elements of surprises and showcases the biggest and best in live music with performances from these talented band and solo artists along with more to come… It's no wonder that The Peach Music Festival is quickly becoming one of the highlights for festival go-ers throughout the summer! The Peach Music Festival takes musicianship to the next level and gives a stage for unsigned acts to play live and also some of the biggest stars, the festival encourages all genres of music. As well as it's performances, you can expect a wide selection of food and craft vendors and free access to the Montage Mountain Ski Resort, which even better is transformed into a large water park in the summer months! Just to make the event even more of an experience for its attendees. Previous acts over the years to take to the stage at The Peach Music Festival include the incredible; Greg Allman, Toots & The Maytals, The Floozies, Widespread Panic, The String Cheese Incident and more!